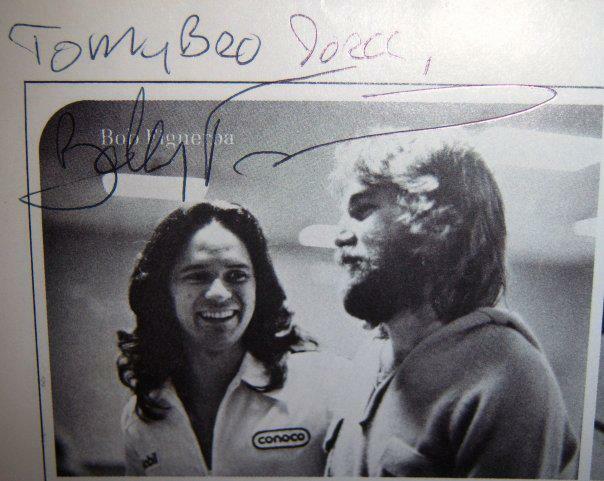 Bobby got his break with the Beach Boys in 1974 ironically when his former band mate from Poverty Train, Carli Munoz suggested he interview with the band to back up Dennis Wilson. Bobby soon not only played back up but performed on percussion, drums and vocals, and stayed all the way through until 1988. Bobby performed on the Beach Boys “LA Light Album”, Dennis Wilson’s “Bamboo” and “Pacific Ocean Blue” albums. He was live on stage with the Beach Boys for some of their most memorable concerts ever including The fourth of July concerts on the Mall, Live Aid, Farm Aid and many others! Bobby’s talents weren’t strictly relegated to live performing and studio work. He was asked to be the band leader for the highly acclaimed “Larry Sanders Show” starring Gary Shandling. For five years Bobby could be seen every week on the top rated show as well as appearances on “Just Shoot Me” and “General Hospital”. Recently Bobby was working with Ricci Martin and his “An Evening of Dean Martin Music and More” and Al Jardine’s Endless Summer Band as well as his own group Corazon Pacifico. Bobby has also been working hard on his ‘baby’ “Canciones de Verano” which in Spanish is “Songs of Summer”. He’s taken some of the Beach Boys most beloved hits and given them his own flair with spanish vocals. I am working on a Beach Boys en Espanol album. In fact, I’ve been working on it for a very long time. What I can tell you now about it is that it’s been a long time coming and I’m very excited about producing my first album entitled, “Canciones De Verano (Songs of Summer).” It’s wonderful to be surrounded by some great talent once again. Some old friends and some new on both sides of the glass. It will be filled with Brian Wilson classics. Some with Latin rhythms, but always true to chord and harmony structure ala the master.